As parents, we always want the best for our children and want to give them a head start in life. The one area that would have the most significant effect on performance is also the area that is the most neglected. We, as a society, greatly neglect proper nutrition for our children. We feed our children poor nutrition, introduce the wrong foods too early, put a strong emphasis on poor quality foods and then expect our children to develop into these healthy, intelligent, successful, leaders of the future. We have the opportunity to make changes and truly give our children the health advantage by focusing on feeding our children high-quality nutritious foods that will properly nourish their bodies, feed their brains and improve performance in all areas of their lives. Our bodies are intelligent. Our bodies are able to turn the foods we eat into every cell, tissue and organ that make up our body. Everything we eat literally nourishes every cell in our body. We need to give our children’s bodies the proper building blocks to build a solid foundation of health. This involves feeding our children the right foods. This is the best way to prevent disease and nurture health. Since the beginning of human existence, our bodies have been hardwired to digest “real” foods in their natural state. The further our foods are from being natural, the more difficult it is for our bodies to break them down and turn them into useful building blocks. Therefore, if we want to build a healthy body, we need to avoid feeding our children processed, refined foods. Refined foods are foods that are stripped of their nutritional value. Often refined foods will be fortified with nutrients, which means that the manufacturers has added some of the nutrients back to the processed food, but since it is not in its original, natural form; the bioavailability of the nutrients is greatly reduced. We need to understand what “non-foods” are. These are foods that may have caloric intake but have no nutritional value, therefore they serve no purpose in forming the foundation of the body. Examples of “non-foods” are refined, processed sugars and flours including candies, chocolate bars, ice cream, pizza, hot dogs and fast food. 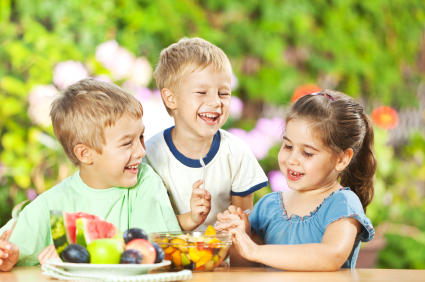 Children need to avoid or limit their consumption of “non-foods”, as these foods do not provide the body with any of the building blocks to contribute to forming a solid foundation of health. The main building blocks of our body are proteins, carbohydrates and fats. Proteins form the bones and muscles of our body. Carbohydrates are needed for making the energy in all cells. Fats form the cell membranes and the nervous system including the brain. Healthy protein sources are beans, nuts, seeds, fish and meat. The healthiest carbohydrate sources are complex carbohydrates such as vegetables and fruits. Complex carbohydrates are rich in vitamins and minerals which are needed for the body to function optimally. Healthy fats such as avocado, nuts, seeds and fish, are important for proper growth and development. Our bodies are made up of 75-80% water; therefore the liquid fuel for our bodies should be water, not juice or pop. Let’s encourage our kids to drink clean, filtered water. There is no doubt that we live in a fast-paced, over-scheduled society, where eating packaged, processed foods is way more convenient than preparing a fresh meal, but we need to get our priorities straight and realize that eating healthy foods is vitally important and should not be put on the back burner as a secondary priority. The best way to prevent chronic disease in adults is to start with feeding our children a healthy diet with real, fresh, natural foods and build a healthy body. This is a diet plan for building a healthy human being, therefore this will not only be beneficial for children but everyone in the family would benefit from this plan. Let’s make health a priority for our children and give them the health advantage in life.